It seems that fractional volumes could be causing the issue, although not sure why your error seems to suggest that the date/time is incorrect. Just make sure you are not including column headers. Thanks for getting back, RL2013 - does that mean it was the 'volume' field that was causing the problem for you? 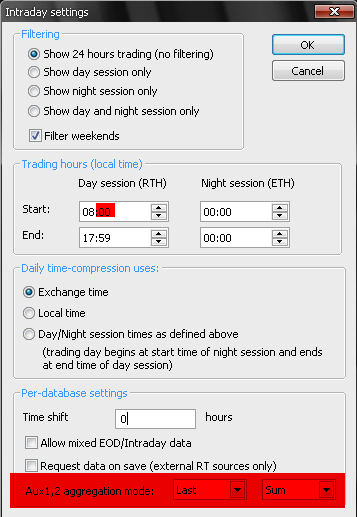 Do you know why Forex Tester 2 freezed when I want to import a file *.csv from Tickstory v. 1.5.1 ? I tried to download in Forex Tester format or in generic bar format without success. Unfortunately we don't know why Forex Tester might freeze - I assume that you have contacted the vendor for assistance? If it's a large file you are trying to import it could just be that it's taking some time. thank you too for providing your tool. Yeah, it was just directed to users who don't know (and are possibly used to more limited softwares). tickstory wrote: In the future we hope to create a data provider that can feed Amibroker through its plug-in architecture. Sounds interesting. thanks for providing that info. BTW, Mr. Janeczko of AmiBroker has recently posted a message to 3rd party data providers on the official AB forum. Attention developers of 3rd party data plugins. be good idea to spread the word about 3rd party options. so the users would have easier way to find out about your data source/ data plugin. Thanks for the heads up - we have contacted Tomasz and he has now listed us on the Amibroker website.